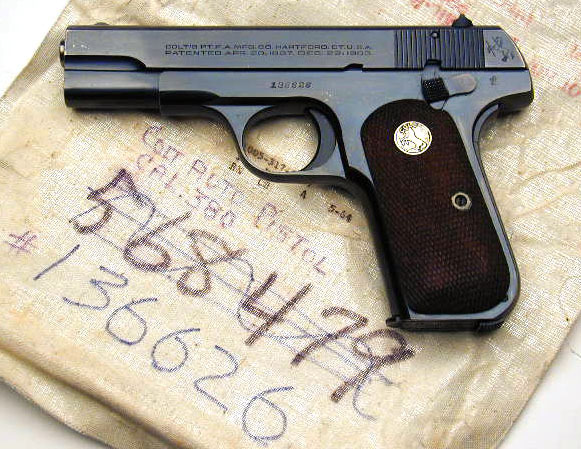 Colt Model M .380 serial number 136626 - An exceptional Model M .380 pistol issued to Major General James Lawton Collins - In 1939, he was appointed to the rank of Brigadier General and was presented his Colt 1908 .380 caliber sidearm, serial number 136626 in 1945. 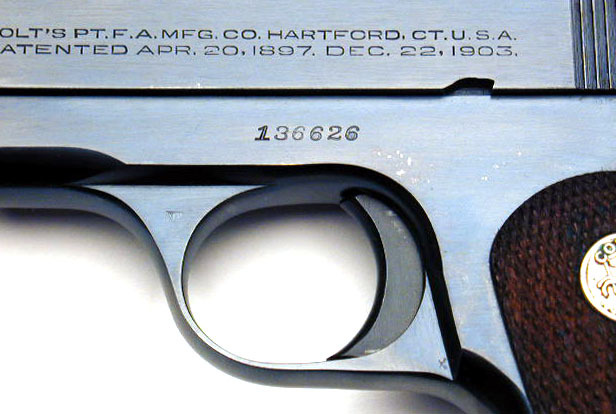 There are records of General Collins also receiving the following .380 pistols, presumably for presentation to other General Officers: 137498, 137542, 137559, 137651, 137838. 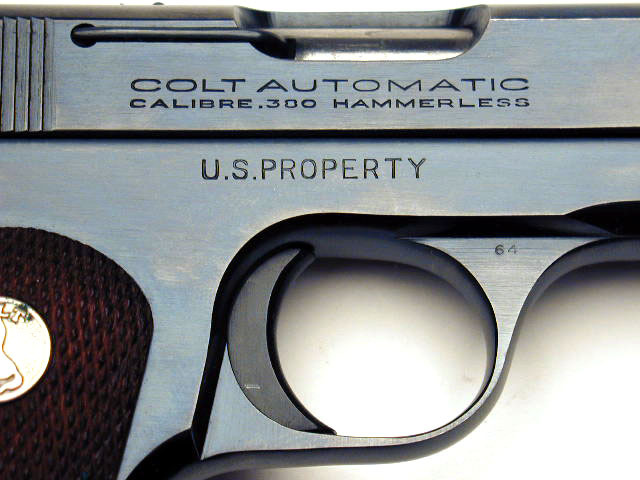 General Collins' .380 pistol pictured on top of the original foil shipping bag for his son's (Brigadier General James Lawton Collins, Jr.) military 1903 Colt .32 ACP serial number 568479 issued to him on on 3/4/65. 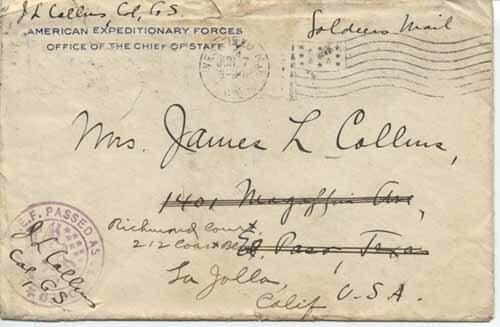 Two original covers: Top addressed to Lt. Col James L. Collins, American Expeditionary Forces, France; bottom addressed to Mrs. James L. Collins from Col. J. L. Collins, General Staff. Born in Louisiana on December 10, 1882 he was a graduate of the West Point class of 1907. 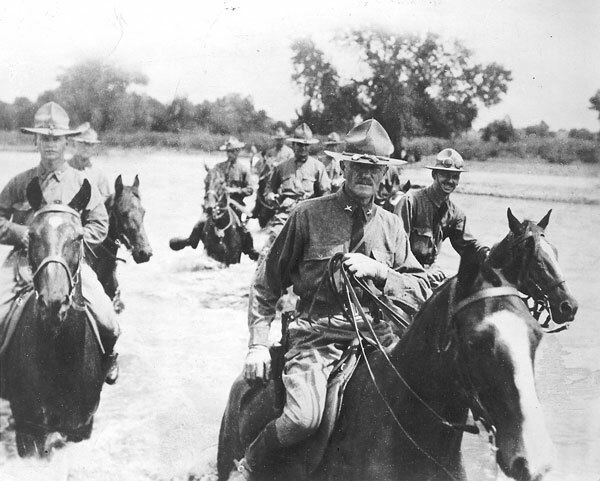 He served in the Philippine Insurrection (1912-1913), initially with the 8th United States Cavalry and then as aide-de-camp to General John J. Pershing. 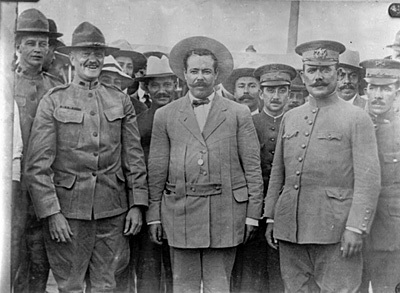 He was also Pershing's aide during the Mexican Punitive Expedition and accompanied him in that role to France during World War I.
and Gen. John J. Pershing and Lt. James Lawton Collins. He later became Secretary of the General Staff at General Headquarters, American Expeditionary Force (AEF) in France during that war, leaving that position to lead a battalion of the 7th Field Artillery, 1st Infantry Division during the last months of the war. Collins was promoted to Brigadier General in 1939 and then to Major General in 1940. During World War II he commanded the Puerto Rico Division (1941 - 1943) and the 5th Service Command at Columbus, Ohio. He retired as a Major General in 1946. He died in 1963, too soon to see his youngest son, Michael, go to the moon as Command Module Pilot of Apollo 11, the first moon landing. He is buried in Section 34 of Arlington National Cemetery. His wife, Mary (September 5, 1916-July 11, 1963), is buried with him. His brother, Joseph Lawton Collins, General, United States Army, is also buried in Arlington National Cemetery. NOTE: His son, James Lawton Collins, Jr., Brigadier General, United States Army, died on 5 May 2002 and is also buried in Arlington National Cemetery. My grandfather, Major General James Lawton Collins, died in 1963 when I was eleven, and as I had spent those years in various military postings in Europe and the United States, I only got to know him during the times we lived in Washington, DC, from 1954 to 1956, and from the summer of 1962 until he died in July of the following year. My first memories of him were at his home in Alexandria, Virginia, at 308 Queen Street, which is a pre-Revolutionary War brick house just up the hill from the Potomac. I remember he used to take me down to the river with a pole and some fishing line to try to catch fish. Mostly we were there to get out of the house, (and my Grandmother's hair), and to spend some time male bonding. I don't think we ever caught any fish. Granddaddy used to tell me stories of his cavalry days in the Philippines, fighting the Moros with General Pershing. He told me of a time when he was riding up a jungle trail on the island of Mindinao, when a Moro warrior stepped out to fling a bolo at him. He ducked and turned his head to see the large knife stuck in a tree trunk just at head level. By the time he drew a weapon in response, the trail was empty and his assailant had melted back into the bush. He was a great horseman, and played many polo matches on Pershing's team. There is a family story that Pershing first noticed him during an All Philippines polo tournament, when my grandfather's team was playing Pershing's team, which had been ahead by one chukkar or goal. With just a minute left to go, James scored twice, winning the match for his team. Next day, he was called in to the General’s office and offered the job of Aide-de-Camp. When my grandfather requested a day to think about, Pershing said he could only have one minute. He took the job, and I guess that minute changed his whole life, because he served with Pershing through the Moro Punitive Expedition, the Mexican Punitive Expedition, and much of the World War. Today his body lies in Arlington Cemetery, just 20 yards from that of the general whom he faithfully served. 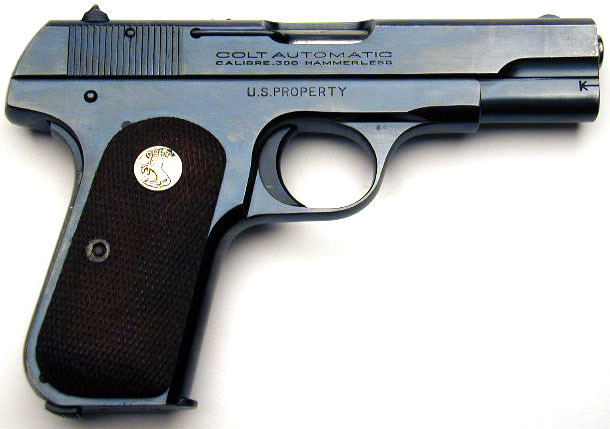 When cleaning out my father's gun case, I found the .380 caliber Model 1908 Colt semi-automatic pistol serial number 136626 wrapped in a military issued foil lined bag bearing serial number 568479 and stored in an old golf-ball box. 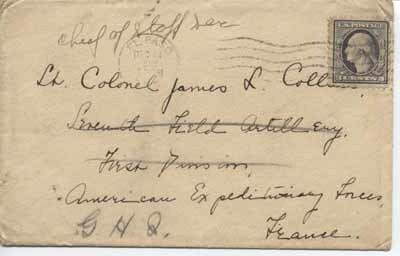 My father, Brigadier General James Lawton Collins, Jr., had placed it there. It seemed to me to be well-oiled and protected from rust. There were no other objects of my grandfather's in the house except some books in my father's library. I remember my mother telling me that many things of his were destroyed in 1969 when our family moved our goods back to America on the SS United States. The hold was partially flooded. 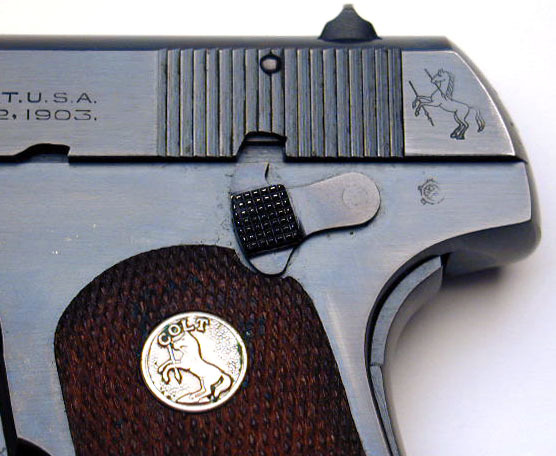 This pistol must have survived because of the way it was packed in grease and covered in plastic. On April 8, 1947, he was appointed to the rank of Brigadier General. 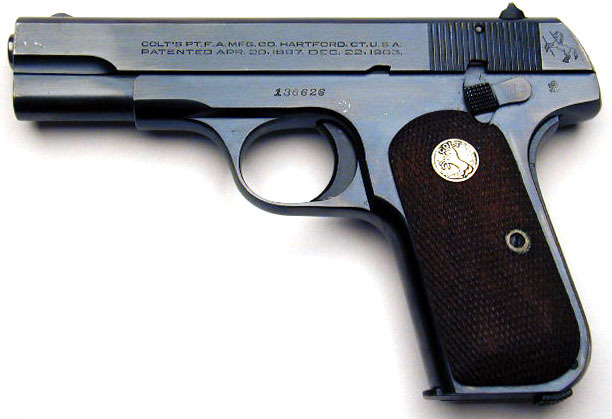 He was presented his Colt 1908 .380 caliber sidearm, serial number 136626 in 1945. Major General Collin's citations and decorations included two Distinguished Service Medals and a Silver Star.